It’s really not that weird. It’s made very much the way cheese is made, only with soymilk (alright, milky soybean water) instead of milk milk. 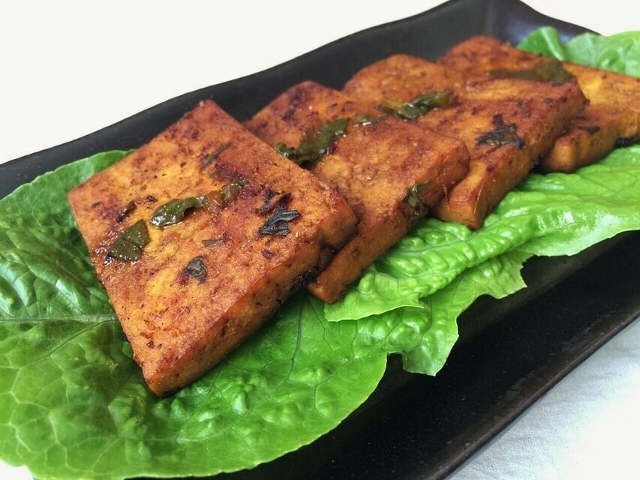 I’m talking about tofu (and because they’re often interchangeable in great recipes, its more firmly textured cousin, tempeh). Many people wonder what you could possibly do with a block of soybean curd (or fermented soybeans) that would taste good. The answer is…pretty much the same thing you do with a chicken breast when you’re trying to figure out how to serve it to your family for the billionth time and you want to change it up somehow: marinate it, cut it in different shapes, grill it, braise it, put it on a sandwich, or put a sauce on it. Cut thinner planks so you get less squishy middle in relation to the firm edges. 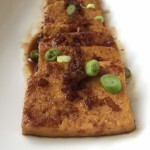 With recipes for baked tofu, play around with cooking time until you get your preferred toughness: crispy on the outside and tender on the inside, or completely dried out and jerky-like. We eat tofu or tempeh weekly, so when I find a good recipe for these high protein meatless slabs, I hold onto it. I thought perhaps you might like to see my well-tested short list of the best ones. This recipe was originally from Cooking Light long, long ago, but the best link I could find was to one of their community boards. I use their marinade recipe (sometimes leaving out the mint and crushed red pepper) and then cook in a bit of toasted sesame oil. The marinade calls for molasses and the only kind I ever use is blackstrap for its nutrition superiority. Instead of vermicelli, I usually serve this tofu with a baked squash and apple dish for a maximum salty and sweet meal. Need a quick meatless meal with plenty of fiber and protein? Vegetarian Times happens to have a few thousand solutions to that problem, and this is one I keep making time and time again. My only teensy tinsy modification is that I remove the tempeh from the pan and sprinkle with 2 tablespoons low sodium soy sauce before sauteing the veggies on their own. I toss it all together again at the end and top with the almond-butter-based sauce. Leave it to Eating Well to embrace this nutritional powerhouse and feature tofu in a magazine that isn’t specifically geared towards vegetarians, just healthy eaters. 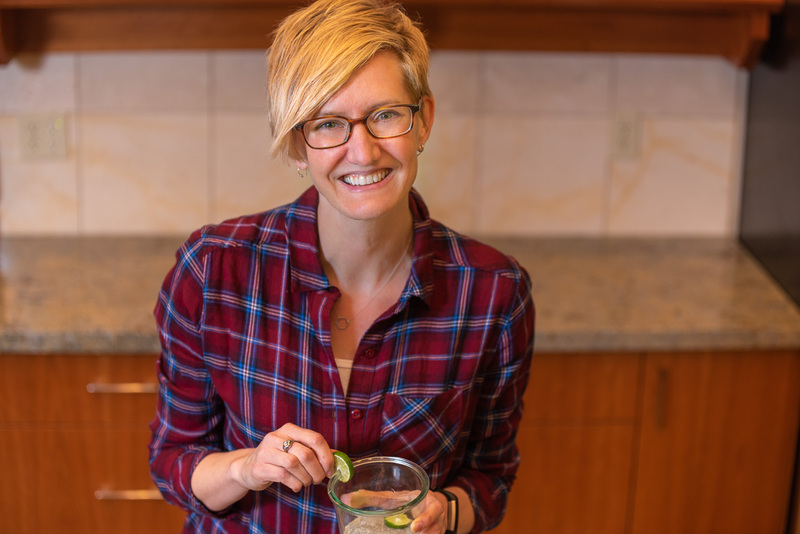 Another reliably good recipe from Heidi Swanson at 101 Cookbooks. And another recipe that tastes equally yummy with tofu or tempeh, whichever you happen to have on hand. To make a meal, I’d suggest pairing this with another of Heidi’s concoctions, Kale and Olive Oil Mashed Potatoes. Heidi strikes again. 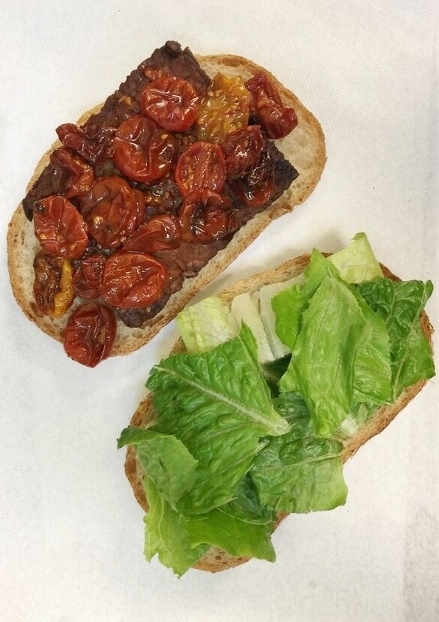 I dare say this is the perfect vegetarian sandwich, probably because of the special treatment the tempeh and the cherry tomatoes receive before you actually put them between two slices of (whole grain) bread. I’ve replaced the somewhat spicy adobo sauce in her recipe with low sodium V8 or tomato sauce many times with good results. You can’t go wrong with recipes from Nava Atlas. You just can’t. I’ve made this one with tempeh, and I don’t always follow the directions to cook on the stove top. When I’m feeling lazy I just toss it in the sauce and bake at 400º for awhile (30 minutes?). And I usually use maple syrup instead of agave, but I don’t think it makes too big of a difference in the final flavor. This recipe was originally in Sunset magazine, and I swear I’ve been making it for at least 20 years. (But according to the internet, it was published in 2002, so I’m a few months off with my calculations.) 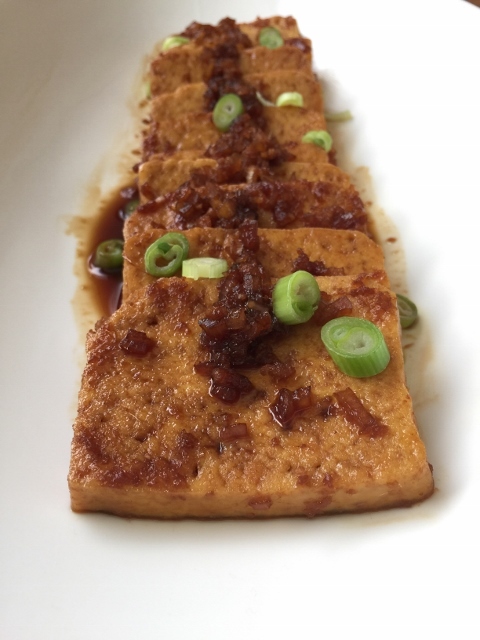 It was one of the first tofu recipes I made after I decided to be a vegetarian that I thought was really spot on. I don’t make any modifications – it’s perfect as is, perhaps because caramelized sugar makes anything taste good. Braising is a moist proposition so I saute the tofu steaks in olive oil first and remove them first before adding the sugar to the pan to make the sauce. This is easy, works equally well with tempeh, and has a very short ingredient list. If you’re in a pinch, forget marinating for an hour and just put it straight in the oven. It’s great (cold) in your lunchbox the next day. Or snacked on piece by piece out of the fridge in the middle of the day. This recipe is utterly remarkable in terms of taste, which is not surprising since it comes from Yotam Ottolenghi of Plenty fame. But nutritionally, it’s got some room for improvement which is why it didn’t make #1 on my list. So. Much. Butter. It’s interesting to note, this is actually a tofu recipe that’s not suitable for vegans. So. Much. Butter. I replace the fresh red chiles with just 2 tablespoons canned diced green chiles because of my spiciness intolerance, and the flavor is still out of this world. Number one for our oven on a busy weeknight is this classic from the meatless masters at Moosewood restaurant. It’s on page 223 of Moosewood Restaurant New Classics cookbook, but I did find a link to share with you too. We’ve made it so many times the pages are nearly falling out of the cookbook. 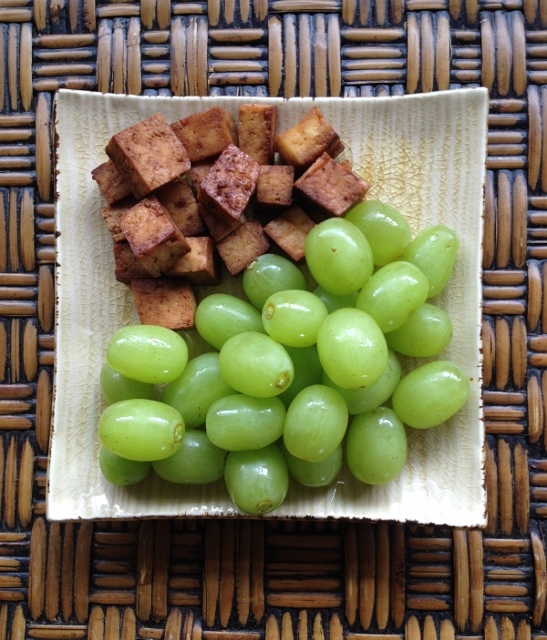 If 10 recipes aren’t enough tofu inspiration for you, and you’d like one more…my other common preparation is my own recipe, Salty Baked Tofu Bites, which you can find in this post (after you click, scroll down, and then scroll some more). Don’t be afraid. I promise…just like with artichokes or miso or broccolini or kiwifruit, the more often you expose yourself to unfamiliar foods, the more normal they become. First get ’em in your cart, then in your house. Pretty soon, seeing bricks of tofu in your freezer next to the frozen peas and that extra loaf of bread will become commonplace. And with 14 grams of protein per 3 ounce serving, you can put those “how do you get your protein” questions to rest quite tastily. 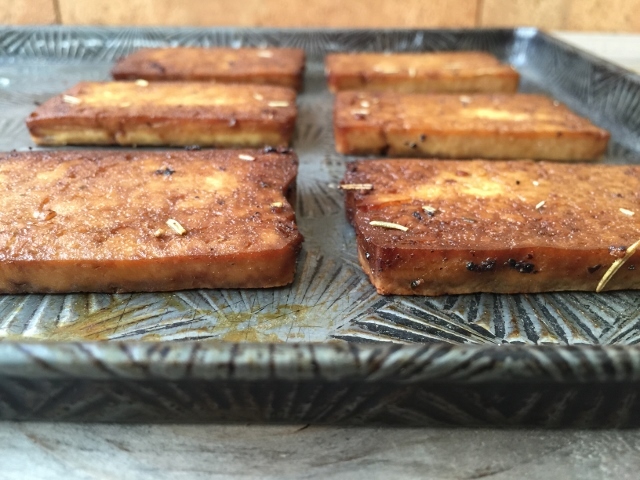 If you are a tofu or tempeh connoisseur or even a beginner with this versatile food, tell me your favorite way to cook up this soy staple. I prefer the extra-firm variety of tofu too, I’m partial to the Trader Joe’s brand for applications like tofu steaks since it seems a bit more substantial. I didn’t realize quite how much tofu we eat until I did a quick search on my own blog…it makes an appearance in soups (usually cubed and pan-fried separately, then added to the soup); tossed with a peanut sauce and served as lettuce wraps; seared in sesame oil and served over rice with an orange sauce; in a coconut curry; and as broiled tofu steaks with a jalapeno vinaigrette. Definitely a staple ingredient in our mostly-vegetarian kitchen! Hi Stacy. Thanks for the tip on the TJ’s brand – I don’t think I’ve ever had that one. And I’m definitely checking out your tofu with orange sauce recipe. That sounds delightful.